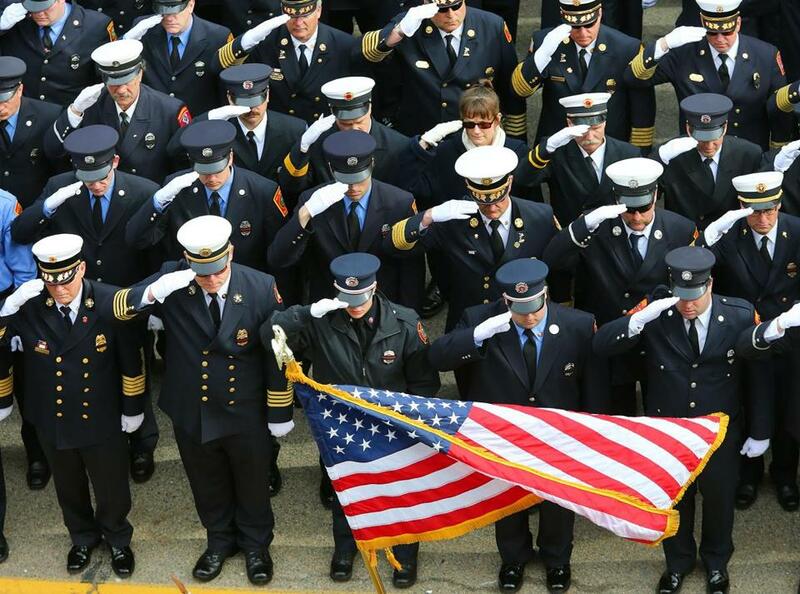 Thousands of firefighters from across the country took part in the funeral for Boston firefighter Lieutenant Edward J. Walsh. Anja Niedringhaus, an award-winning Associated Press photographer, was killed on the job last Friday when an Afghan policeman in Khost fired an AK-47 into the back seat of the car in which she and three colleagues were traveling. Niedringhaus died instantly. She was 48, and had been covering conflicts and war zones, which she considered “the essence of journalism,” since the siege of Sarajevo in 1992. By every account, she was a wonderful person and a superb journalist. On the day Niedringhaus was murdered, the front page of the Globe was dominated by news of the funeral for Michael Kennedy, one of two Boston firefighters who died battling a nine-alarm fire in Back Bay. Kennedy’s funeral, like that of Lieutenant Edward Walsh Jr. the day before, was attended by an estimated 10,000 firefighters from three continents, who streamed into Massachusetts from all 50 states and as far away as Australia. Each man was laid to rest amid solemn pageantry and a stunning show of solidarity: a sea of fellow firefighters, in dress blue uniforms and white gloves, standing 15 deep in a formation that stretched for six or more blocks. There was more solemnity and solidarity in Plymouth yesterday, where police officer Gregory Maloney was buried after he died in a motorcycle crash while on patrol. A funeral service for Niedringhaus will be held on Saturday near her birthplace in Hoxter, Germany. I don’t doubt that her memorial service will be well attended by her friends, loved ones, and longtime colleagues. But nobody expects news photographers by the thousands to be on hand as she is laid to rest. No one imagines that media outlets will do what fire departments and police departments do as a matter of longstanding and honored custom: namely, send representatives to be part of the final goodbye when a comrade anywhere has been killed in the line of duty. In no way is this meant as a swipe at the news media. It is no different when a social worker or a taxi driver or an oil rig worker is killed on the job. I mention Niedringhaus only because of the timing of her killing. The violent death of a brave photojournalist with a passion to record and bear witness to the realities of war, like the death of brave firefighters who heroically charged into a burning building, was a heartbreaking tragedy and a profound communal loss. Yet the grief felt by the public when any firefighter or police officer falls surpasses by an order of magnitude the anguish experienced in almost any other case. Perhaps that is because firefighters and police officers react to the death of a colleague — any colleague, anywhere — with such overwhelming and visible solidarity that it is impossible for the rest of us not to be moved. Maybe if nurses or truckers or storekeepers — or journalists — did something similar when one of their own was cut down, the killing of a nurse or trucker or storekeeper would invariably be regarded as a big story and an occasion of great public sorrow. To be sure, police and firefighters have a special cachet by virtue of their role as public safety officers. Their jobs are grounded in ideals of civic duty and a culture of service, Wellesley sociologist Thomas Cushman explains; so when someone dies on the job, “there is a requirement to pay homage to the sacrifice and reaffirm the sacred duty of the public servant.” That reinforces the first responders’ deep ethos as a brotherhood. The elaborate rituals, symbolism, and grandeur of police and firefighter funerals intensify that sense of moral kinship among those who wear the uniform, while simultaneously sending the message that the death of one individual is a reason for all of us to grieve. Had anyone asked Walsh and Kennedy, as they rode Engine 33 to that fateful call on Beacon Street, what would happen if they didn’t make it back alive, this much they would have known for sure: Thousands of firefighters from across the country and beyond, most of whom they had never met, would turn out to bid them farewell. To see such a tribute in all its grave splendor and haunting sadness is to grasp the magnitude of what is lost when a human life is cut short. Would it be practical for other trades and professions to send thousands of mourners when one their comrades is killed on the job? Maybe not. But oh, would it be powerful.